Happy New Year! It’s two and half weeks into the new year, but better late than never. Now, Forager has a reason to celebrate this month. It was named one of the 9 baking blogs to follow in 2017 by Bake from Scratch Magazine. A big THANK YOU to this new publication, from Hoffman Media, for featuring me among the list of other creatives that I greatly admire. It’s an exciting way to start the year and with this new year come new aspirations. New life goals and the continued pursuit of old ones. I’m not a new year resolution type of person, but it is a time of refocusing for me. The new year serves as a reminder of what’s important and what’s not. To continue to pursue being as authentic as possible; especially creatively. I’m excited to share the new creations mulling around my mind this year and that’s enough to pull me momentarily out of my current January Blues. Every year, like clockwork, this is the time when I find myself in a funk. Particularly when it comes to food. All burnt out on fatty meals and decadent desserts; my eyes are craving color and my body freshness. 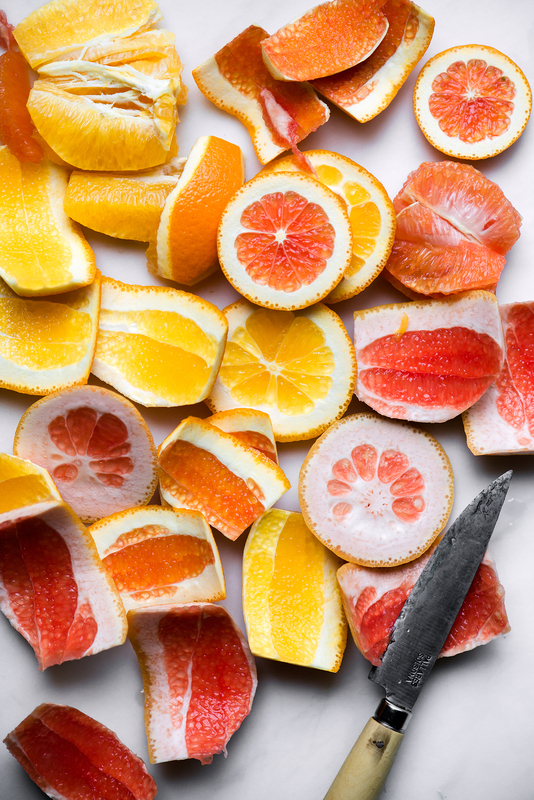 Spring seems eons away, but one of the bright spots in this grey month is citrus. 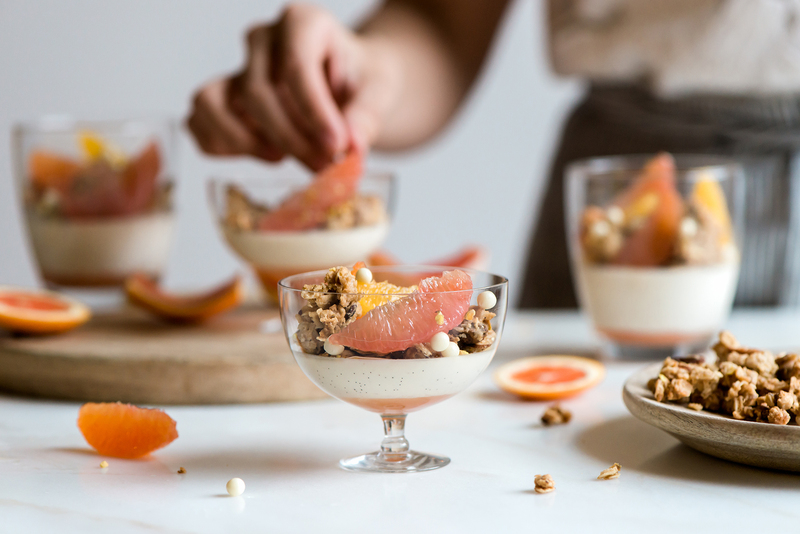 Winter citrus is the heartbeat of January and it’s the star of this week’s light dessert: Citrus & Coconut Panna Cotta with Coconut Cashew Granola. It was challenging to put myself into the dessert mood these past couple of weeks. If I was going to eat a dessert it had to be very light and not too sweet (as usual). Something tart, bright, and in small portions. All of which perfectly describe these panna cottas. The bottom layer is comprised of a grapefruit gelée (fancy French word for ‘jellied’). It’s made from freshly squeezed tart grapefruit juice and set to just barely firm enough to scoop with a spoon. The next layer of creamy coconut panna cotta is poured on top and is flecked with hundreds of tiny vanilla bean seeds. The strong coconut flavor comes from using both coconut milk and steeped coconut flakes. 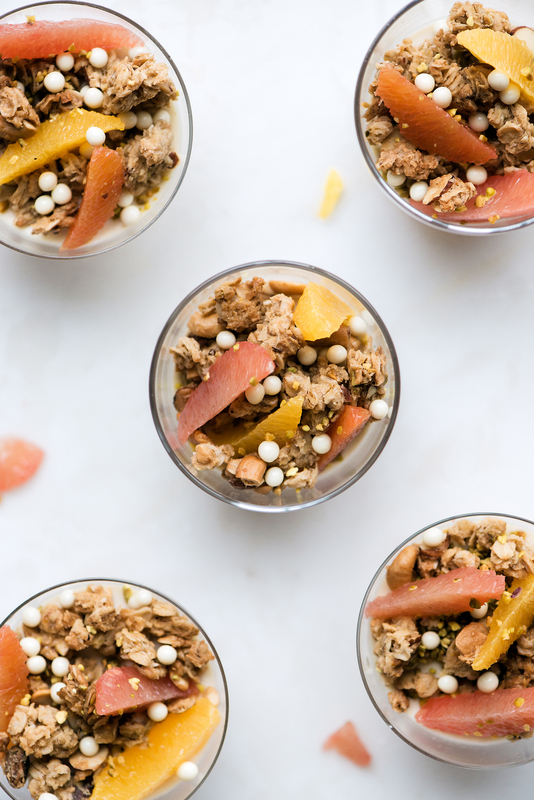 For the finale, it’s topped with chunky clusters of coconut cashew granola and fresh citrus segments. Every bite has a silky, crunchy, chewy, tart, sweet texture and flavor. Enjoy it as a dessert or do what I did this weekend- enjoy it for breakfast. The portions are intentionally small on these panna cottas. They’re meant to be a light experience, but feel free to increase the ingredient amounts if you desire larger portions. This recipe uses gelatin sheets to set the gelée and panna cotta. Gelatin sheets, or leaves, work similarly to powdered gelatin, but are dried into flat sheets instead of a granular form. They’re easy to use and offered in varying strengths of firmness setting (bloom), such as bronze, silver, and gold. They produce a clearer outcome to the final set dessert; which in this recipe creates a very pretty jewel-toned grapefruit gelée. Check your local specialty grocery store or order online for an inexpensive price (which is what I recommend). Set six small glasses onto a baking sheet lined with a Silpat or other slip-resistant liner to prevent glasses from sliding. Set aside until ready to use. Bloom the gelatin sheet in a bowl of very cold water (enough to completely submerge the gelatin, at least 8 oz/227g). Set aside for 5-10 minutes or until gelatin is soft and flexible to the touch. Gently squeeze out water from gelatin right before adding it to a warm liquid. Meanwhile, in a small pot, bring the grapefruit juice and sugar to a simmer. Remove from heat and add softened gelatin. Whisk to combine until gelatin has dissolved into the warm liquid. Pour 1 Tbsp of mixture into each glass and then transfer baking sheet to the refrigerator. Chill grapefruit gelée until set, at least 1 hour. Preheat the oven to 350F (177C). Spread out shredded coconut onto a small baking sheet. Place into the oven to toast until deeply golden, about 10-13 minutes. Stir occasionally during baking to ensure even toasting. Meanwhile, combine coconut milk (be sure to thoroughly combine the thick coconut cream and milk), heavy cream, sugar, and vanilla bean seeds with scraped pod in a medium sized saucepan. Set over medium-high heat and bring to a simmer. Remove from heat and add in toasted coconut. Cover with a lid and allow to steep for 10 minutes. Meanwhile, bloom the gelatin sheets in a bowl of very cold water (enough to completely submerge the gelatin, at least 8 oz/227g). Set aside for 5-10 minutes or until gelatin is soft and flexible to the touch. Gently squeeze out water from gelatin right before adding it to a warm liquid. Using a fine-mesh strainer, strain steeped coconut mixture into a clean saucepan. Place over medium heat and heat just until warm to the touch, about 1-2 minutes (not simmering and not hot). Remove from heat and whisk in softened gelatin until dissolved. Transfer warm coconut panna cotta to a container with a pourable spout for easier pouring, such as a large liquid measuring cup. Remove grapefruit gelée glasses from the refrigerator and evenly distribute coconut panna cotta into each glass (about 2 oz/57g). Carefully, transfer filled glasses back to the refrigerator to chill until completely set, at least 2 hours. Once set, cover each glass with plastic wrap until ready to serve. Stored panna cottas will keep for up to four days. Preheat oven to 300F (150C). Line a baking sheet with parchment paper or a Silpat. In a bowl, combine oats, cashews, almonds, pistachios, coconut flakes, brown sugar, flour, and salt. In a small pot, over medium heat, melt together butter and maple syrup. Pour over the oat mixture and stir until thoroughly combined. Spread out granola onto prepared baking sheet and bake for 30 minutes, stirring lightly halfway through. 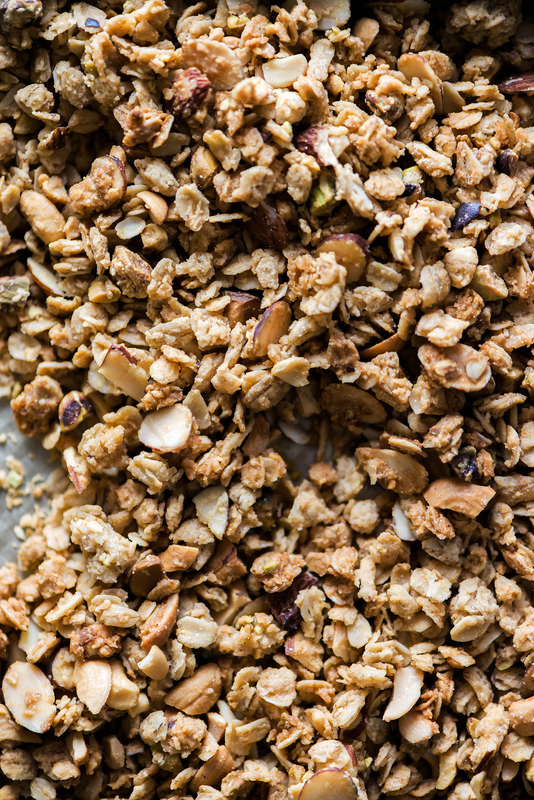 Remove granola from oven and let cool completely before using. Store granola in an airtight container, at room temperature, for up to three weeks. To supreme (how-to video tutorial here), place the grapefruit on a clean cutting board. Using a sharp knife, trim off the bottom and top (you want to see the grapefruit flesh peeking out). Rest the grapefruit, cut side up. Next, carefully slice the rounded sides lengthwise by placing the knife blade between the peel and the flesh. Follow the contour of the grapefruit to guide you. Once all the peel has been removed, carefully cut off any white pith that remains (it’s very bitter). At this point, the entire flesh of the grapefruit should be exposed. To cut a grapefruit segment, place the knife blade between one of the membranes and the flesh. Cut until you reach the center of the fruit. Repeat the slice on the other side of the segment. Slide out the finished segment using the knife blade. Repeat until all the segments have been cut. Repeat the process with the orange. Squeeze out the juice from the empty membranes into a airtight container. Store leftover fruit segments, in their juices, in the refrigerator for up to three days. 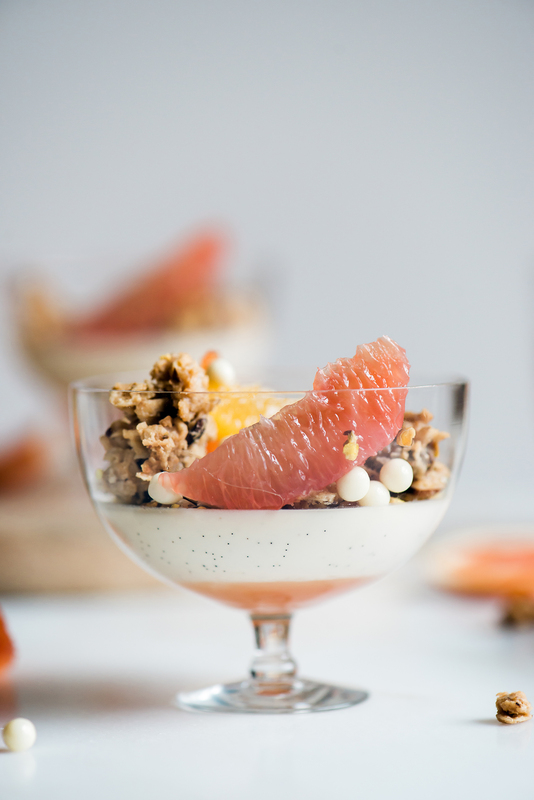 Top each panna cotta with a handful of granola, two segments of grapefruit, and two segments of oranges. Sprinkle on any additional garnishes if desired, such as crunchy white chocolate pearls or chopped dried fruits. Serve immediately and enjoy. As a pastry chef myself I have to tell you how fabulous this dessert looks! This is outstanding work! Agreed! Gelée sounds so much better than jelly. ;) It’s all about finding the balance in textures. Thank you for sharing this excellent recipe. Light and not too sweet= my favorite! Thank you, Gina! Yes, not too sweet is a must (especially after all the holiday gluttony;). Thanks for stopping by! These look so gorgeous and I was wondering how you got the vanilla beans to be spread out throughout the panna cotta, because whenever I make it, all the lovely speckles always ends up all at the bottom of the glass! Hi Alex, thank you! Try giving the panna cotta a good stir just before pouring. The motion will bring most of them up. Be sure to scrape out any leftover seeds (from the pouring container) into the glasses as well. The panna cotta mixture has a good viscosity and should suspend the tiny seeds fairly well. Ok, do you think that it would make a big difference to the viscosity if I omitted the coconut flakes and milk and used regular 2% milk instead? Also, what is the difference between powdered gelatin and silver sheet gelatin? Hi Alex! Are you asking if it’ll change the consistency of the panna cotta if you omit both the coconut flakes and coconut milk? If so, then yes it will. As for gelatin sheets, they work similarly to powdered gelatin, but are dried into flat sheets instead of a granular form. For more details, read the blog writing itself (particularly the paragraph before the recipe). 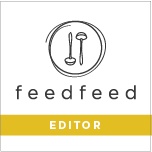 In my blog posts, I usually provide informative details on the recipe ingredients or suggestions on modifying the recipe. Hope this helps! The layers are so beautiful, and I love those dreamy citrus hues! Thank you, Laura! It’s really nice to see something other than brown and grey in January. Those pink hues get me every time. Panna Cotta is so delicious and this one looks really refreshing and bright. A lovely dish. Absolutely stunning! I can’t wait to give these a try, perfect time of year! This panna cotta looks UNBELIEVABLE! So so good. Love the citrus! Thank you, Gabi! Citrus is such a refreshing flavor during the cold winter months. It’s something to look forward to each year.